Manny displays excellent conformation, density of fiber with amazing consistent CRIMP and soft handle! He has coverage down to his toes and even covering his toes (See picture 5)! Man of teel has 10 Grey ancestor in his pedigree!!! Manny sheared an incredible 7.2Lbs of fiber on 6-5-2008, and he was not even 2yrs old yet! Man of Steel just bred his first female 10-1-2008, and he bred for 26minutes his first time! Matterhorn has only won 1st place and Championship ribbons so far in his show career! Matterhorn is a striking Full Accoyo Multi-Colored herdsire who combines West coast genetics of the fawn Accoyo herdsire Durazno (Uribe) on the paternal line and Accoyo Ganador on the maternal line. 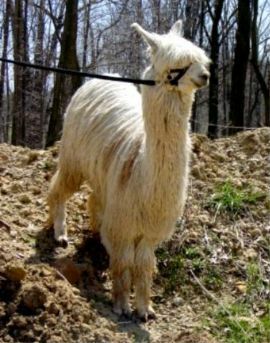 His fawn Accoyo sire Apache II was 1999 AlpacaFest Northwest Suri Champion and has produced many fine crias. 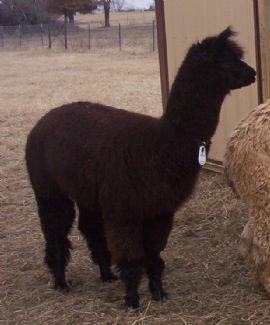 His dam, Accoyo Mallory Jane, produced a female cria, Baby Jane, who won a suri fleece championship at AOBA last year. Matterhorn combines a dense, locking, high luster fleece with great conformation and presence. According to Amanda Vandenbosh, "if there is such thing as a super suri, this one is it, he is the total package". And "never has she seen a suri male with such a pleasing disposition".